Natural products like eggs, fresh scallion and tomatoes tasting so elegantly earthy!!! 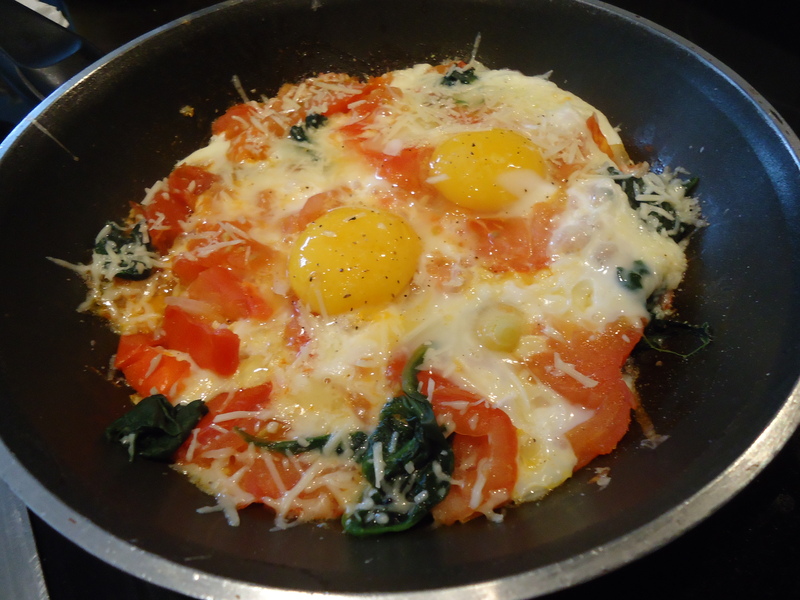 Here what I put together last Saturday, a delicious start to embellish my day! Spray organic olive oil or butter in a medium non stick skillet. Chop one fresh small scallion. After 2 minutes or 3, add 3 medium well riped tomatoes sliced. Let the tomatoes cook for at least 4 minutes at medium heat. When the tomatoes juices are giving, add the spinach. Crack 3 eggs over it, set the heat to medium low, cook the eggs at your taste, slowly – 2 minutes before serving, drop a teaspoon of butter just in the middle. Sprinkle grated parmesan (here you could also do it with fontina or taleggio, thin shaved for more intense flavors). When done, sprinkle the truffle salt, two or three times. And it’s done!!! A Table!!! Una delizia to start your day!! !